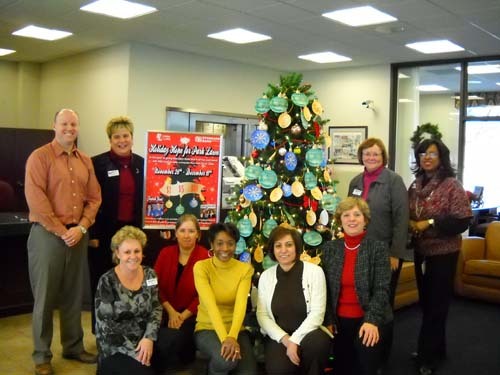 Two Oak Lawn Standard Bank and Trust branches collected and donated $1,100 during the first “Holiday Hope for Park Lawn” to benefit the residential facilities of Park Lawn. The collection was held from November 26th to December 18th at two Oak Lawn Standard Banks addressed 4001 W. 95th Street and 4700 W. 111th Street. Both locations sold decorative ornaments in increments of $1, $5 and $10. Each Standard Bank customer that bought a supporting ornament personally placed it on the Standard Bank holiday tree. Donations will help purchase much needed items for Park Lawn’s residential facilities. Currently Park Lawn has a total 9 residential facilities and anticipates growth. Items will include everything from pots and pans to outside plants that make it feel more like a home. Standard Bank Branch Manager Victoria Scanlon mentioned while touring Park Lawn’s day program facility in Oak Lawn that they anticipate continuing the “Holiday Hope for Park Lawn” collection drive in future years. For over 60 years Standard Bank has been supporting local organizations and remains committed to investing in the communities it serves. Standard Bank and Trust Co., operates 43 full service locations throughout Chicagoland and Northwest Indiana. More information about Standard Bank and Trust is available at www.standardbanks.com. Photo: Park Lawn would like to thank all of the employees at the Standard Bank Oak Lawn Branches for recent collection drive, “Holiday Hope for Park Lawn”. The total money raised of $1,100 will benefit Park Lawn’s Angel Program. As you can see in the photo, it was a great success. Photo back row (L-R): Dan Faragoi, Jean Fornal, Peggy Fox, Karyn Debroe. Front row: Tani Kurecki, Cheryl Scott, Denise Newson, Hellwey Hadieh, Victoria Scanlon.